Click the thumbnail images above to view in full size! Variously known as the D-117, the K4, or just the "Chinese Army Key" these heavy duty straight keys were made for the Chinese Peoples' Liberation Army (PLA) in factories owned by the PLA, from the early 1960s to the present time. 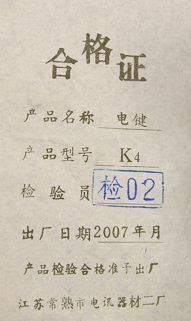 The Chinese phrase on the key's nameplate "changshu dianxun qichai chang" translates as "Changshu Telecommunication Equipment Factory," which was the last of several factories to make telegraphic equipment. In 2000, Morse Express obtained remaining stocks which were purchased direct from the PLA as surplus. They were mostly in factory new condition, with some showing a bit of "warehouse wear" such as deteriorated packaging and dust. Supplies were limited, and apart from being a good heavy-duty straight key, they are also very collectable. See our Collectors' Corner page for some of the "varieties." In 2004 we were able to get in touch with a factory agent in China, and were delighted to discover that the keys were still in production. And by going direct to the factory, we were able to get better prices. They are still expensive to ship from China, of course, but we are happy to pass the s avings along to our customers. The keys have chrome plating, , hard silver contacts, and a felt pad on the base. They weigh around two and a quarter pounds each! Approximate base dimensions are 2-3/4 x 4-3/4 inches. They're 2-1/2 inches high and the center of the knob is forward of the base about an inch. A heavy cable is attached internally, with a 1/4" mono plug. Some users have said that the spring tension is too heavy, but it can be adjusted by stretching the spring and/or clipping off a turn. But the orthodox approach (first described to me by a professional ship's radio officer) is to close the gap until the contacts are touching, then back off until there is the tiniest perceivable gap. With that adjustment, the K4 will key with the slightest touch and you might even need to increase the spring tension a bit. Click the thumbnail image above to view in full size! The K7 keys are out of production. The info will remain here for reference purposes. 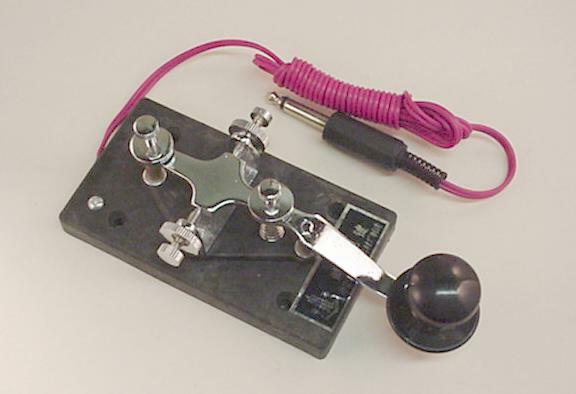 This is the key the PLA uses to train its new Morse operators. If he survives the three months of training, the "Big John Soldier" (recruit) is given a K4 or D117 for operational use. These are inexpensive keys, on heavy composite bases, but they are well made, fully adjustable, and feature nice touches like genuine needle bearings and seats for the trunion. Cord with 1/4" phone plug on the end is included. The cord attaches to binding posts, and the wiring on the base is recessed into routed channels. The base measures just a bit smaller than the D117/K4, and the total weight of the key is a mere 8 ounces. The factory also made a K5 key which is identical to the K4 except that it has HPb59 hard brass contacts instead of silver. They cost about $20 less than the K4. 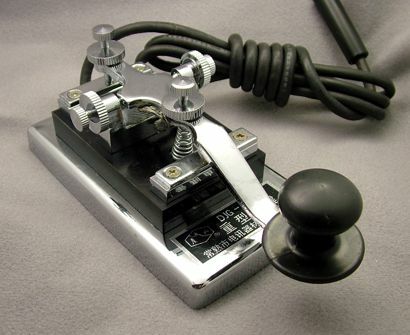 Manufacture of the K5 key was discontinued in 2010 and our last shipment of them arrived in 2013. 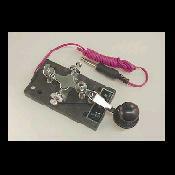 Earlier the factory made headsets and a K65 semiautomatic bug key. Here is a scan of the factory's last brochure.